Does your kitchen need a makeover? New, refinished kitchen cabinets can go a long way. Most people tend to focus on the appearance of the cabinets, but they forget that organization plays a huge part. After all, if your cabinets are not large enough, well-spaced, or numerous enough, you will still end up with a cluttered, unfinished look to your kitchen. That is why Classy Closets focuses on the beauty of your cabinets as well as functionality. Read more about some of the features of our cabinets that make your kitchen one-of-a-kind. We can install and finish cabinets with a variety of looks. Do you like the look of dark, rich wood? Do you prefer a more vintage-looking, distressed look? Call us no matter what your preference. We stay current with all of the latest styles and trends for kitchen cabinetry. If you prefer your kitchen island to be a different finish than the wall cabinets, we can help. We will give your kitchen a cohesive, clean look with all of the details you love. Your kitchen cabinetry would not be complete without the details: hardware, knobs, handles, glass fronts, bead boarding, crown molding, and more. Our cabinets feature exquisite molding details and a variety of hardware options to choose from. Whether you prefer a rustic, country, contemporary, or vintage look for your kitchen, we can complete the style with the right details. We guarantee your kitchen will be one-of-a-kind when we are done. 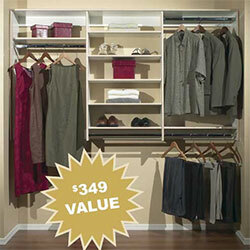 People know and love Classy Closets for our ability to provide customized cabinets for every household. We never create the same kitchen look more than once. We will work with you to design cabinets of varying shapes and sizes, molding designs, finishes, and arrangements in the kitchen. We do not believe that one blueprint fits all. Call us today for your consultation and start designing your new kitchen cabinets today.